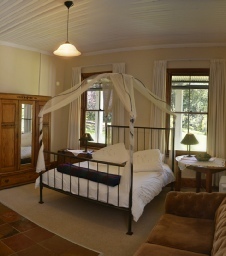 Thistledown Country House is set on 20 acres nestling amongst farmlands just below the Karkloof Hills in the KwaZulu-Natal Midlands. These hills are covered with the second largest tract of indigenous forest in South Africa. The Nkonkwane stream tumbles down from these hills, flows through the Thistledown property and meets up with the Karkloof River further downstream. crowned and black eagles as well as a complex variety of flora and fauna. 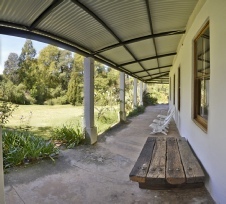 Because of its situation in the tranquil Karkloof Valley, Thistledown Country House is the ideal place to escape from the city. Your hosts at Thistledown Country House are Norma and Norman Maguire and Donald Knight.